One factoid that I omitted from my Homeschool Convention posting was that Fiddledaddy decided to take the kids on a little mini-vacation to Disney World while I was busy conventioning. I left this information out because I didn’t want to be all LOOK! ROBBERS! WE’RE NOT AT HOME! Not that I have all that many nefarious criminal types that read my blog. But you can’t be too careful. Frankly, I think it was a criminal mastermind that thought up the Foursquare Twitter/Facebook app that pinpoints your location whenever you leave your home. And that’s how I feel about that. Actually, an out of town trip for Fiddledaddy and the children made complete sense, since whenever I leave town without my little brood, they wind up at the McDonald’s drive-thru window for EVERY SINGLE MEAL, looking forlorn. No matter how much I had slaved over a hot stove pre-preparing meals for them in anticipation of my absence. What Fiddledaddy hadn’t taken into account was that he would be trapped in a small hotel room with all 3 children. For 4 days and nights. Without the benefit of me. He chose the Disney All-Star Movie Resort hotel for the stay. Which is kind of like the Motel 6 of Disney World. It is economic and festive. We haven’t stayed at any of the All-Star hotels since Jensen was born, because technically, the rooms are designed only for a small family of 4. This was the state of the room as we were checking out. Not bad considering a tornado hit it. In a moment of weakness, I allowed Fiddledaddy to talk me into accompanying my family for the first night of their adventure. The plan was to then take me to my very swanky hotel the next day, where I would bask in the glow of childlessness. As I aided in the unpacking of 5 suitcases, an ice chest, and assorted backpacks filled with cherished toys, Jensen looked around at the crowded hotel room and said, “I’M READY TO SEE THE OTHER ROOM.” What other room, dude? “THE OTHER ROOM BESIDES THIS ONE WHERE WE’RE STAYING.” There’s no other room. “WHAT? THIS IS IT??? ?” There was no way around it. We were sardines in a square can. We packed Jensen’s little inflatable toddler bed, which just barely houses his 5 year old self. And the 2 girls were relegated to sleeping with one another in a double bed. Just like Mary and Laura in pioneer days, I reminded them. It seemed almost cruel to put both of them in such close quarters. I wondered if Mary and Laura were violent sleepers as well. I chucked as I thought how excellent karma is. Instead of hitting the amusement parks, Fiddledaddy figured he would wile away the hours with the offspring at the hotel pool, and at the nearby water park, Blizzard Beach. An excellent choice, since it has already hit Africa hot here in Florida. And while I was away, they enjoyed the fine dining experience of the hotel food court and the local McDonald’s. 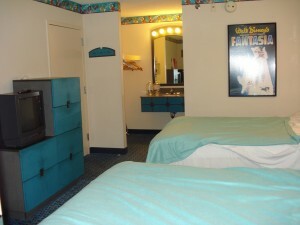 I do have to say that I personally love the Disney All-Star hotels. Fiddledaddy and I stayed at the All-Star Music hotel on our honeymoon. And I think since then we’ve managed to stay at each of the All-Star hotels (Movie, Sports, and Pop-Century). The price can’t be beat, and it is such a fun atmosphere. Frankly, I think it says a good deal about our family. Fiddledaddy survived his mini-vacation and all the children are still alive. Although I think he would use the term “vacation” rather loosely. But really, he wins Father of the Year in my eyes. He gave our children some memories they will cherish forever. Love it that your hub would do that for them while you’re away. What a great dad! We have that same Blue, it was Ryan’s when he was two, he will be 16 in a couple of weeks and has not been passed down to the 2 year old of the house. 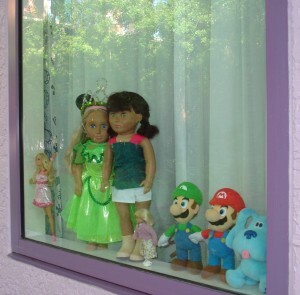 I loved seeing it in your picture in the window. As fun as it was, I must admit that my heart belongs to Wilderness Lodge! We’ve stayed there twice – I could live there! That’s my idea of camping! « A Winner, A New Giveaway, and bullet points, oh my!